St Thorwalds shares a private driveway with the upper apartment and has been lovingly maintained by the current owners over the last 34 years. 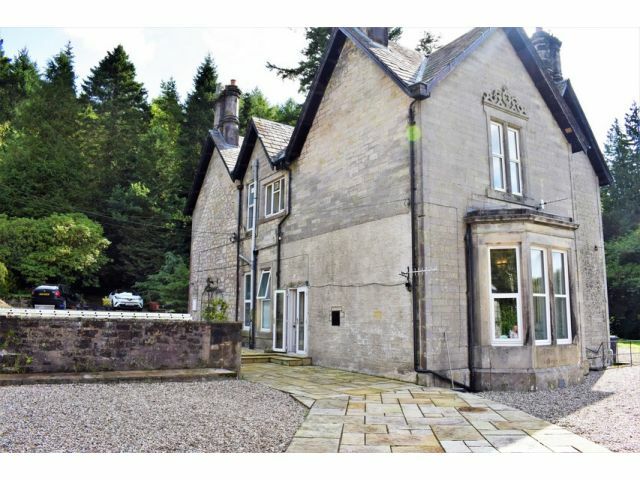 Providing exceptional views over countryside to the South and West of Langholm. Front gardens extend down to the main road and include part of the track bed from the old branch railway line which was closed in the 60's. Spacious Lounge with large bay window benefiting from a Multi Fuel Burner, Dining Kitchen with an Essay multi fuel range. Master Bedroom w/ En Suite Shower Room, Two Further Large Bedrooms, Study, Bathroom and useful Cellar. The outside area consists of mainly patio and gravel sections to the side and rear, tiered front garden leading down to a mature wooded area plus a lovely original stone built summerhouse to sit and enjoy the views. Window to side with original shutters. Wall light, original tiled flooring. L shaped hallway with partial original cornicing, two wall lights, smoke alarm. Radiator, original flooring. Access to cellar. Bay window to front. Original cornicing, four wall lights, telephone point, TV point. Multi fuel burner set into feature marble hearth and surround. Two radiators, carpeted flooring. French doors leading to patio. Window to rear. Recessed lighting, two wall lights. Range of wall and base cabinets. Stainless steel sink and drainer with mixer tap, tiled splashback. Electric cooker with extractor fan. Plumbing for dishwasher and washing machine, space for tumble drier. Esse wood burning range in dining area. Radiator, vinyl flooring. Door to garden. Window to side. Ceiling light, radiator, carpeted flooring. Window to rear. Ceiling light, wall light. Bespoke wardrobes included in sale. Radiator, carpeted flooring. Window to rear. Fully tiled. Ceiling light, extractor fan. Toilet, wash hand basin and shower cubicle with mains fed shower. Carpeted flooring. Bright and light bedroom with bay window to front and window to side. Original cornicing, ceiling light. Radiator, carpeted flooring. Window to side with original shutters and cornicing, two wall lights. Range of wardrobes and furniture included in sale. Radiator, carpeted flooring. Opaque window to side. Ceiling light, fully tiled. Modern suite comprising of toilet, wash hand basin and bath with overhead shower. Illuminated mirror included in sale. Heated towel rail, underfloor heating, tiled flooring. Parking area with parking for 2/3 vehicles. Low maintenance gardens with gravel and patio sections. Tiered front garden leading to wooded area. Original stone built summerhouse with electrics to sit and enjoy the views. Mains water, electricity, oil central heating and mains drainage. Offers in the region of £200,000 are invited and should be submitted to lj Residential, 93 High Street, DG12 6DJ or by fax to 01461 205037. GREAT PRICE REVIEW - Home Report Value £240,000!